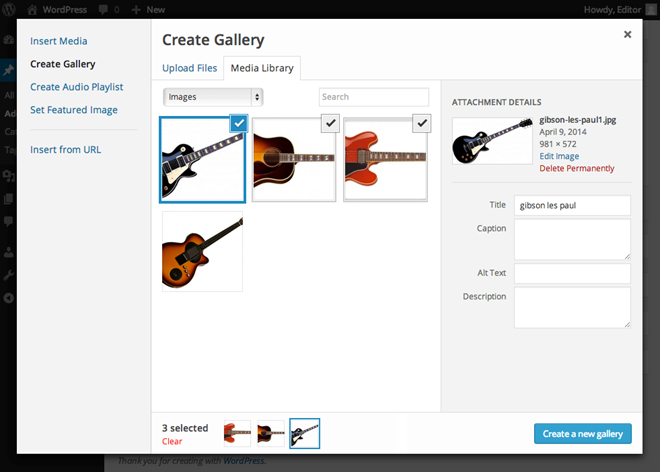 Any media you add to a page or post is automatically included in a Gallery for that page or post. You can sort the order of media in the gallery by clicking on any media file, holding down the mouse button and dragging it to a new position in the list. You can also manually enter the order for each media file in the Order box. Clicking on the Show link will show you the options as previously explained in the media library section. The gallery settings on this page allow you to link the thumbnails of your media files to either the image file (displayed on its own in the web browser) or the attachment page which looks and feels like a normal post on your website but contains only the media file. You can also choose to display the images by menu order (as they appear in the list above) by name or date. Choosing descending will reverse the order you have chosen. Gallery columns will organize the gallery into the number of columns you specify. For example, if you specify three columns and you have five images on the gallery, the gallery will display a row of three thumbnails followed by a second row of two. Once you are happy with your settings, click on the Insert gallery button to insert the gallery into your page or post.